Plain Silver Rings An attractive selection of contemporary rings in plain silver. A variety of different sizes and designs. Suitable for both men and women. The range includes the four and six piece puzzle rings. Amber Rings A new collection of silver rings set with amber. Some of these rings were available from Amberstall.com before it amalgamated with silverstall.com. 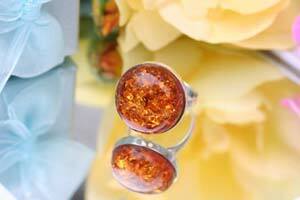 A lovely little collection of silver rings that all use real amber as a setting. Rings with Gemstones A range of beautiful silver rings with semi-precious stones including zircons, garnets, amethyst, blue-topaz, amber and rose-quartz. 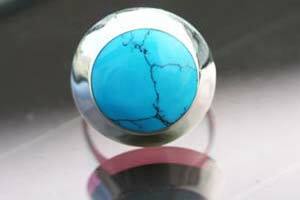 This stunning round cut turquoise ring makes a marvelous present of jewellery. | Toe-rings with crystal stones Add sparkle or colour to your metatarsals with a selection of toe rings all cast from sterling silver. There are some in plain silver designs whilst others have gemstone or crystal settings. Silver rings which covers the full finger. These armory rings are not simply Goth Jewellery but classical jewellery for anyone to wear and enjoy. A unique silver bat ring that spreads its wings over two fingers. The definitive item of Christian jewellery. Inscribed with the lords prayer this solid ring is made from high quality stainless steel. The iconic silver skull ring. This chunky silver ring spans four decades of changing fashions and remains a favorite in many jewellery boxes. If your ring is stuck on your finger the easiest method we have found to remove it is to spray onto the finger some "WD40" which is an electrolyte lubricant. It relaxes the finger muscles whilst at the same time lubricates the ring. Rings have been worn throughout the ages. Their history can be traced back to early civilisations. 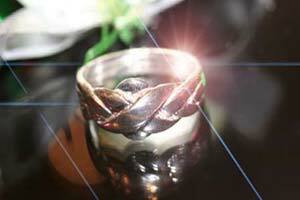 Since ancient Egyptian times the ring has been considered a symbol of eternity. We recommend to remove excessive tarnishing that may build up over the years using a good quality polish cloth. 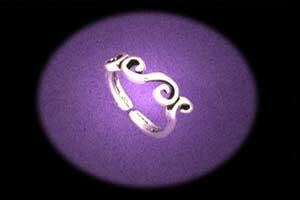 If you are buying a ring for a Birthday present or for somebody else please try and check ring sizes beforehand. Copyright © 2018 silverstall.com If you are considering buying a gift for another then aside fro the size also try and find out if that person is already wearing a ring, (for example a wedding ring) and consider if the new ring would clash with it.